Sometimes the best dishes are the simplest. 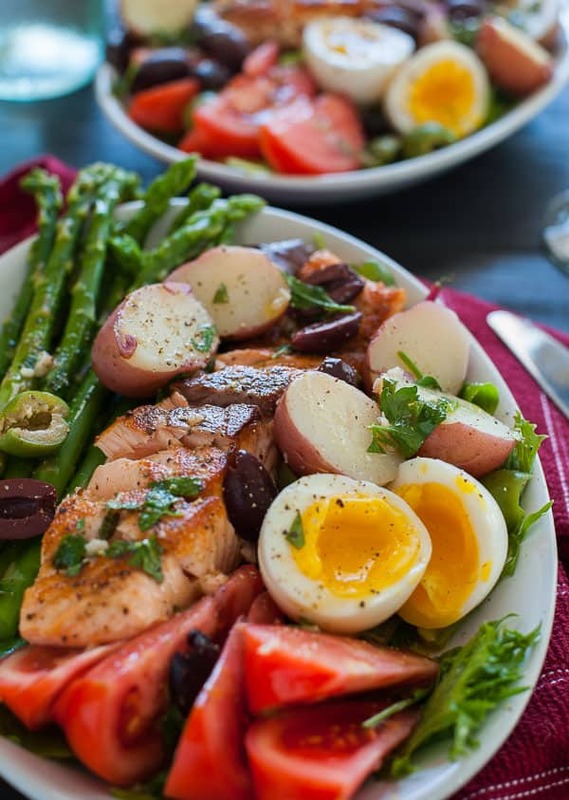 That’s what this delicious springtime seared salmon salad nicoise is. Make this for your significant other and impress the heck out of them. I know that Mary Jo was impressed. Spring means asparagus and I like to have it frequently, especially when it’s on sale. 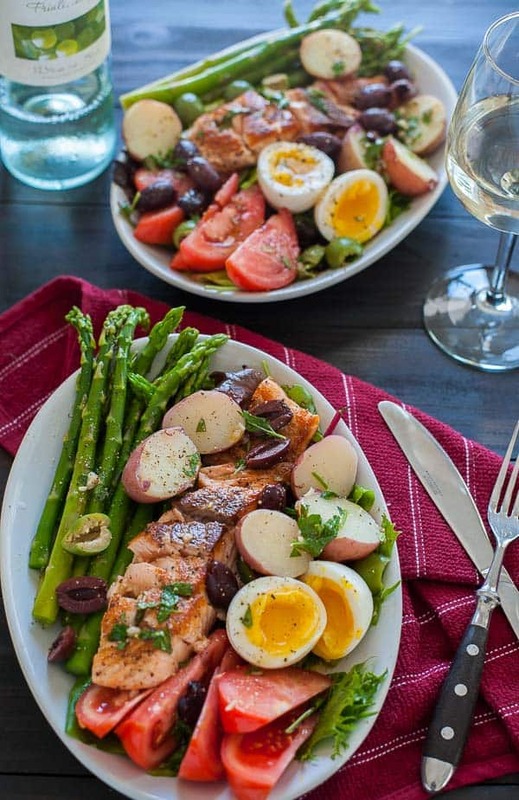 A traditional salad nicoise usually has green beans but asparagus is a nice substitute. The salmon tastes wonderful with the vegetables, but seared tuna would be nice too. Your choice. 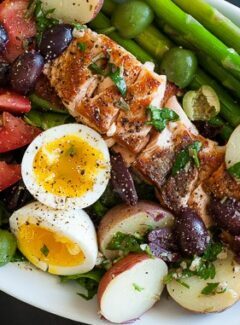 To make this, just mix up a vinaigrette containing chopped parsley, dijon mustard, red wine vinegar, lemon juice, tarragon, olive oil, salt and fresh ground pepper. I mixed the vinaigrette in an OXO Good Grips salad dressing shaker. Pour it on some salad greens and use for the base of the plate. Boil some baby potatoes and soft boil a couple eggs. This dish is going in the direction of yum. This is totally delicious stuff. To cook the asparagus, steam it for about four minutes and plop the stalks into an ice bath to stop the cooking. The salmon is really the star of the dish and it should be pan seared in a very hot pan. I personally like either a cast iron skillet or the carbon steel skillet which I used for the salmon. You can get these two skillets really hot to create a marvelous crust on the salmon…and you only sear it for a couple minutes per side. I used about 3 tablespoons of vegetable oil in the skillet and let it get up to over 400° before I laid the salmon into the pan. Place it in and don’t move it for 2 minutes. Turn with a spatula and sear the second side a couple minutes. By then it will have a super sear, remove it from the pan while assembling the plate. The salmon will have a nice char but will be tender in the middle. Chop some ripe tomatoes into wedges and halve some olives of your choice. I used some kalamata and some large green olives. Assemble the components on a platter and drizzle with a little more of the vinaigrette. 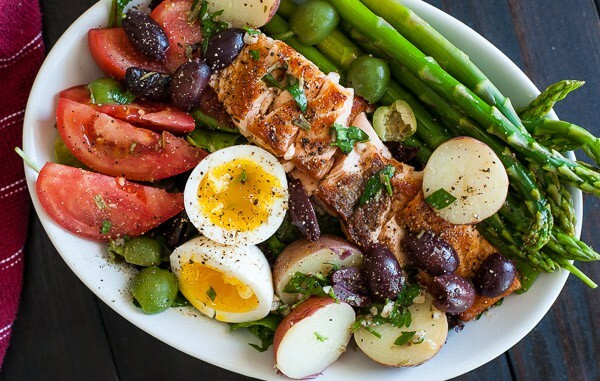 Sprinkle with some salt and pepper and sit down and eat your salmon salad nicoise. 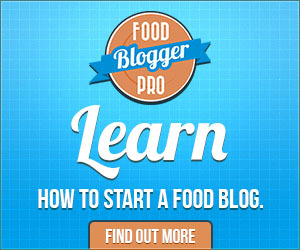 Disclaimer: This recipe post contains an affiliate link which means that if you purchase anything through the link, Joe’s Healthy Meals will earn a small commission at no extra cost to you. Using a salad oil shaker or lidded jar, mix all ingredients and shake to emulsify. Place salad greens in a mixing bowl and add 1/2 to 2/3 of the vinaigrette, toss to coat. Clean then slowly boil the potatoes until done, 18 to 20 minutes. Steam the asparagus 4 minutes then place in an ice bath to stop the cooking. Boil the eggs, 6 1/2 minutes for runny yolk, 8 to 9 minutes for hard yolk, place in ice bath 30 seconds to cool. Salt and pepper all sides of the salmon and sear in a hot cast iron or carbon steel skillet with 3 tbsp of vegetable oil, 2 minutes per side then remove to a plate. Assemble the dish on a good sized plate, first placing the greens down, then laying the remaining components, with the seared salmon in the middle. Coat with additional vinaigrette and salt and pepper to taste. The vinaigrette contributes a lot of calories to this. For less calories, use a vinegar, lemon juice based dressing using less oil or even a low fat store bought dressing. I love salmon and I love the direction this dish is heading. I will set my GPS to YUM! Tasty, Tasty , Tasty !!! Hey Alan, it is really tasty. Thanks Eileen…it’s a tasty main course salad. Wonderful, wonderful meal that I could eat once a week!